For other uses, see Wayuu (disambiguation). Wayuu (also Wayu, Wayúu, Guajiro, Wahiro) is a Native American ethnic group of the Guajira Peninsula in northernmost part of Colombia and northwest Venezuela. 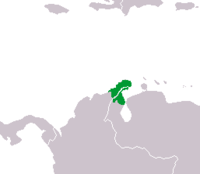 The Wayuu language is part of the Maipuran (Arawak) language family. The Wayúu inhabit the arid Guajira Peninsula straddling the Venezuela-Colombia border, on the Caribbean Sea coast. Two major rivers flow through this mostly harsh environment: the Rancheria River in Colombia and the El Limón River in Venezuela representing the main source of water, along with artificial ponds designed to hold rain water during the rain season. Although the Wayuu were never subjugated by the Spanish, the two groups were in a more or less permanent state of war. There were rebellions in 1701 (when they destroyed a Capuchin mission), 1727 (when more than 2,000 natives attacked the Spanish), 1741, 1757, 1761 and 1768. In 1718, Governor Soto de Herrera called them "barbarians, horse thieves, worthy of death, without God, without law and without a king". Of all the Indigenous peoples in the territory of Colombia, they were unique in having learned the use of firearms and horses. In 1769, the Spanish captured 22 Wayuus in order to put them to work building the fortifications of Cartagena. The reaction of the Indians was unexpected. On May 2, 1769, at El Rincón, near Río de la Hacha, they set their village afire, burning the church and two Spaniards who had taken refuge in it. They also captured the priest. 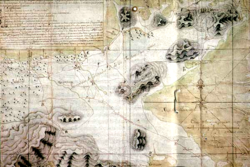 The Spanish immediately dispatched an expedition from El Rincón to capture the Indians. This force was led by José Antonio de Sierra, a mestizo who had also headed the party that captured the 22 Guajiro. They recognized him and forced his party to take refuge in the house of the curate, which they then set afire. Sierra and eight of his men were killed. This success was soon known in other Guajiro areas, and more men joined the revolt. According to Messía, at the peak there were 20,000 Indians under arms. Many had firearms acquired from English and Dutch smugglers, sometimes even from the Spanish. These enabled the rebels to take nearly all the settlements of the region, which they burned. According to the authorities, more than 100 Spaniards were killed and many others taken prisoner. Many cattle were also taken by the rebels. The Spaniards who could took refuge in Río de la Hacha and sent urgent messages to Maracaibo, Valle de Upar, Santa Marta and Cartagena. Cartagena sent 100 troops. The rebels themselves were not unified. Sierra's relatives among the Indians took up arms against the rebels to avenge his death. The two groups of natives fought at La Soledad. That and the arrival of Spanish reinforcements caused the rebellion to fade, but not before the Guajiro had regained much territory. The process of evangelization of the Wayuu people restarted in 1887 with the return of the Capuchin friars under reverend friar José María de Valdeviejas. In 1905, Pope Pius X created the Vicariate of La Guajira with friar Atanasio Vicente Soler y Royo as first Vicar, in an attempt to "civilize" the Wayuu people. The friars then created the orphanages for Wayuu children beginning with the La Sierrita orphanage, built in the Sierra Nevada de Santa Marta mountains in 1903, followed by the San Antonio orphanage, located by the Calancala River, in 1910, and the Nazareth orphanage in the Serrania de Macuira mountains in 1913, creating a direct influence over the Rancherias of Guarrachal, El Pájaro, Carazúa, Guaraguao, Murumana, Garra patamana and Karraipía, with Nazareth exerting some control over the rancherias of Taroa, Maguaipa, Guaseipá and Alpanapause. The friars constantly visited the settlements inviting the Wayuu to attend mass. Wayuu children in the orphanage were educated with traditional European customs. Conflicts between the Wayuu people and the Colombian government decreased since then. In 1942 Uribia celebrated Christmas and New Year's Eve for the first time. The Wayuu are the largest indigenous ethnic group in Colombia. 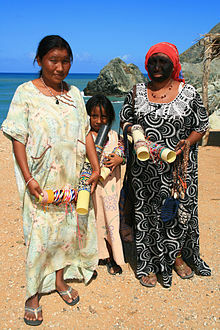 According to a 1997 census in Colombia, the Wayuu population numbered approximately 144,003 – representing 20% of Colombia's total Amerindian population and 48% of the population of the Department of La Guajira. The Wayuu occupy a total area of 4,171 square miles (10,800 km2) within approximately ten Indian reservations, eight of which are located south of the Department (including a major one called Carraipia). In Venezuela, the Wayuu population is estimated at 293,777, according to the 2001 census, with some 60,000 living in the city of Maracaibo. This makes the Wayuu the largest indigenous group in Venezuela, representing 57.5% of the Amerindian population. Wayuu communities are not uniformly distributed within these territories, as their population is concentrated primarily in the outskirts of such settlements as Nazareth and Jala'ala, on the plains of Wopu'muin and Uribia, and within the municipalities of Maicao and Manaure, where population densities are some of the highest in the peninsula. This irregular distribution is intimately related to seasonal changes in weather – during the dry season, a significant proportion of the population crosses the border into Venezuela to work in the city of Maracaibo and its nearby settlements; once the rainy season begins, these Wayuu tend to return to their homes on the Colombian side. The Wayuu people refer to themselves simply as "Wayuu" and do not acknowledge the term "Indian", preferring instead the term "people". They use the terms Kusina or "Indian" to refer to other ethnic indigenous groups, while using the term Alijuna (essentially meaning "the one who damages") to refer to outsiders or persons of European ancestry. The Wayuu language, called wayuunaiki, is part of the Arawak language family predominant in different parts of the Caribbean. There are small differences in dialect within the region of La Guajira: the northern, central or southern zones. Most of the younger generation speak Spanish fluently but understand the importance of preserving their traditional language. To promote cultural integration and Bilingual education among Wayuus and other Colombians, the Kamusuchiwo'u Ethno-educative Center, or Centro Etnoeducativo Kamusuchiwo'u, started an initiative to create the first illustrated Wayuunaiki-Spanish, Spanish-Wayuunaiki dictionary. The central figure of the Wayuu religion is Maleiwa (God) creator of everything, of the Wayuu and the founder of society. Pulowi and Juya, spiritual beings, like demigods, are a married couple associated with procreation and life, where Pulowi is the female figure related to the wind and dry seasons, and Juya the male, is a nomad and related to hunting who is seen as a powerful killer. Wanülu represents the evil spirit being of illness, and death. Puberty is not very important among boys, but girls are exposed to rituals as early as 12 years old or when they start menstruating, requiring them to go through a period of seclusion for anywhere from two months up to two years. Girls are obliged to shave their heads and rest in a chinchorro or large hammock. During this period, Wayuu girls are taught how to be a wife in which a large part consists of cooking and learning the art of crocheting Wayuu bags. She is also fed with a special vegetarian diet called Jaguapi, and bathes frequently. Women play important roles in the society, but it is not quite a matriarchal one. The Wayuu want their[who?] women to be wise and mature. Nearly all marriages are arranged and accompanied by a dowry, which is given to the mother's brothers and uncles. Young girls are promised to men of the clan as young as 11 years old, around the time they are becoming of child-bearing age. The perceived intention is to wed her to a man before risking that pregnancy out of wedlock or arrangement, a cause of great social shame, specifically for the woman's family's honor and credibility. Men may have multiple wives (polygamy). The Wayuu believe that the life cycle does not end with death, but that a relationship with one's bones continues. Burials are very important. The relatives of the dead act in a certain way: first, the body is buried with personal belongings; after five years, the bones are exhumed, put into ceramics or a chinchorro (hammock), and reburied in the clan's cemetery. A traditional Wayuu settlement is made up of five or six houses that made up caseríos or rancherías. Each ranchería is named after a plant, animal or geographic place. A territory that contains many rancherias is named after the mother's last name; that is, society is matrilineal. The Wayuu congregated in rancherias are usually isolated and far from each other to avoid mixing their goat herds. Typical Wayuu rectangular "day house" with hammocks by the Caribbean Sea. The typical house is a small structure called a piichi or miichi, generally divided into two rooms with hammocks to sleep in and keep personal belongings such purses or mochilas of acrylic fiber and ceramics to keep water. Wayuu culture is known for making Wayuu bags or mochilas. There are many styles of mochilas. A susu is a backpack typically 20cm-30cm wide and 35cm high, used to store personal and work items. Characteristic for the fabrics are the decorating patterns inspired by nature and what the culture sees around. Living quarters are either rectangular or semi-circular. Close to the main house is a common area called a luma or enramada, similar to a living room but almost in the open. Built of six pillars with a flat roof, it is used for everyday duties and to attend to visitors and business activities. Family members hang their hammocks there for the noon nap. Traditionally, the walls are made of yotojoro – a wattle and daub of mud, hay and dried canes, but some Wayuu now use more modern construction with cement and other materials. The preferred material for roofing and yotojoro wood is the dagger cactus (Stenocereus griseus), which the Wayuu call yosú. The word yotojoro originally referred to the cane-like inner wood of the yosú cactus. This plant is used for many other purposes: it is planted to create living fences around pastures; young shoots are fed to goats; the fruit (iguaraya) is similar to pitahaya and is a popular food among the Wayuu. Because the demand for yosú as food and wood is seasonal, at times there is little fruit, building material or even cuttings for fences. It has thus been proposed to develop techniques for the Wayuu to cultivate it. Due to varying supply of yosú wood for construction, other plants are also used, including trupillo or turpío (Prosopis juliflora), jattá (Haematoxylum brasiletto), kapchip (Capparis zeylanica) and kayush (Peruvian Apple Cactus, Cereus repandus). Traditional musical instruments include kashi, sawawa (a type of flute), ma'asi, totoy and the taliraai (tubular flute), wootoroyoi (a type of clarinet), among others. Wayuu women learn how to weave at a very early age. The Wayuu are descendants of the Caribs and Arawak peoples, largely known for their strong weaving tradition. The Wayuu carry on this traditional weaving. Weaving and crocheting make up part of their daily life, especially for women. Most of the women presently weave or will do it at some point through their lives. The men participate in the industry as well; they make the straps, provide the materials, and transport the goods to the city centers. The tribe produces millions of high-quality artisan products every year. This artisan weaving industry plays a vital role in the local economy, and the people are known most for the mochila Wayuu or Wayuu Bag. The Wayuu have resented the way that foreigners have profited more from their work than do the artisans. The feature film Pájaros de verano (Birds of Passage, 2019) is set on the Guajira peninsula and among the Wayuu in the 1970s. Directed by Cristina Gallegos and Ciro Guerra, it stars José Acosta and Carmiña Martínez. In addition, many non-actor Wayuu are included in the film, which is primarily in the Wayuu language. It explores the disruption of traditional clan culture after members of the tribe enter the drug trade, and are affected by great wealth and violence. Pütchipü'ü, the mediator in the traditional Wayuu justice system. ^ "Wayuu Patterns in Wayuu Bags ⋆ Wayuu Mochila Bags - Official Online Store". Wayuu Mochila Bags - Official Online Store. Retrieved 2018-07-26. ^ Diana, Miller (2018-05-02). "The Wayuu Artisan Industry - WayuuMarket.com". WayuuMarket.com. Wayuu Market. Retrieved 2018-07-23. ^ "Wayuu Bag: un negocio redondo a costa del patrimonio cultural - Las2orillas". Las2orillas (in Spanish). 2015-03-25. Retrieved 2018-07-23. Wikimedia Commons has media related to Wayuu. This page was last edited on 21 April 2019, at 07:14 (UTC).